On Saturday, Karalynn and I were in the kitchen. Annabelle was napping in her bed. Lacy and Gabby were upstairs in the bonus room playing. Scott was mowing the lawn. The smoke detector went off in Annabelle’s room. Did Annabelle wake up? NOPE. Not even a peep. Slept through like, well, like a baby! What DID happen was that Mommy found out just how dedicated her oldest daughter is to fire safety. Even though it was middle of the day and there wasn’t a speck of smoke to be seen or smelled, that girl dashed out of the kitchen faster than I could blink, screamed for her sisters “Lacy, Gabby, FIRE FIRE” then flung open the front steps and all but flew out to her daddy who was mowing the lawn, yelling the whole way. If there was a fire, she sure was NOT going to get caught in it. I’ve never laughed so hard in my life. Much to Karalynn’s consternation, her sisters had not heard her screaming their names. When I told her all was clear, she marched back in the house and started lecturing them, because if there was a fire, they’d obviously be engulfed in flames by now. I told her next time she might want to open the bonus room door on her way out so so they could hear her… but I digress. So yes, fire safety is present and accounted for in the Phillips’ household. No worries on that! There is the pesky issue of having oxygen tanks sitting around the house, though… so her mad dash to the door if it had been real is a VERY good thing! Discussion: Okay curious mom here. They always teach to do “pretend” fire drills with your kids. Honestly, I haven’t done so, although we have discussed in depth where to go and what to do. 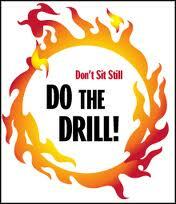 Do you do fire drills in your house?